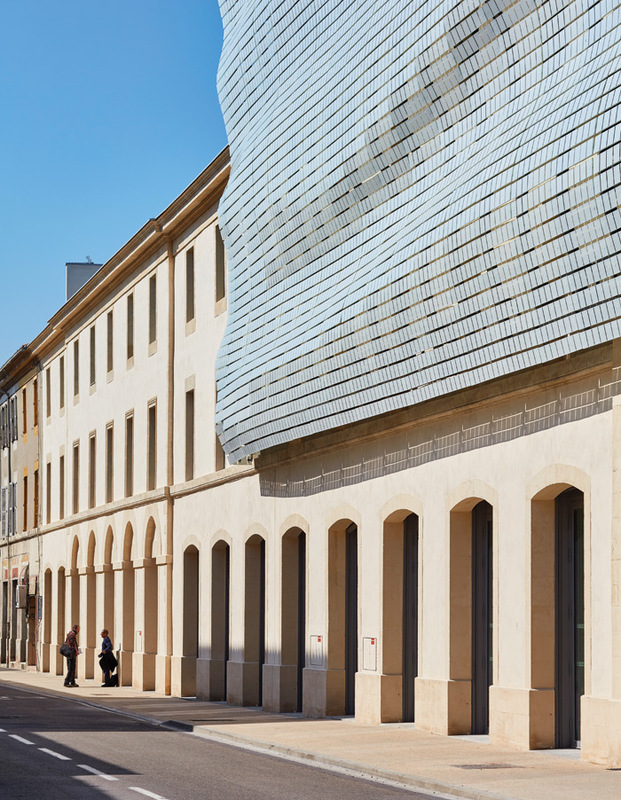 Elizabeth de Portzamparc’s new Musée de la Romanité in Nimes responds to two millennia of history with undulating reflections and a building that draws the city into — and on to — it. It’s been 1,545 years since the Romans lost the southern French city of Nimes to the Visigoths. This year, they regained territory with a museum dedicated to their civilisation — the Musée de la Romanité. Has it been worth the wait? Recent buildings are virtually non-existent in the dense, ancient townscape of central Nimes. The only notable exception has been Norman Foster’s Carré d’Art (1993), a gallery and library, which faces the Maison Carrée, once a temple and one of the city’s three great Roman monuments. 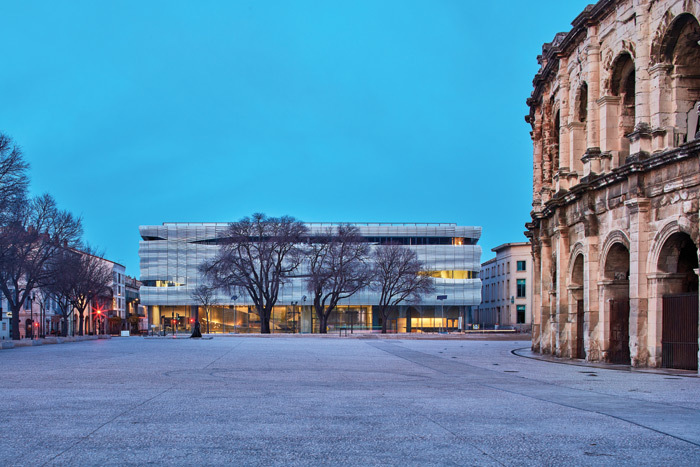 In 2011, the city launched an architectural competition for a new museum about the Romans, and all three monuments would have a role in its story. 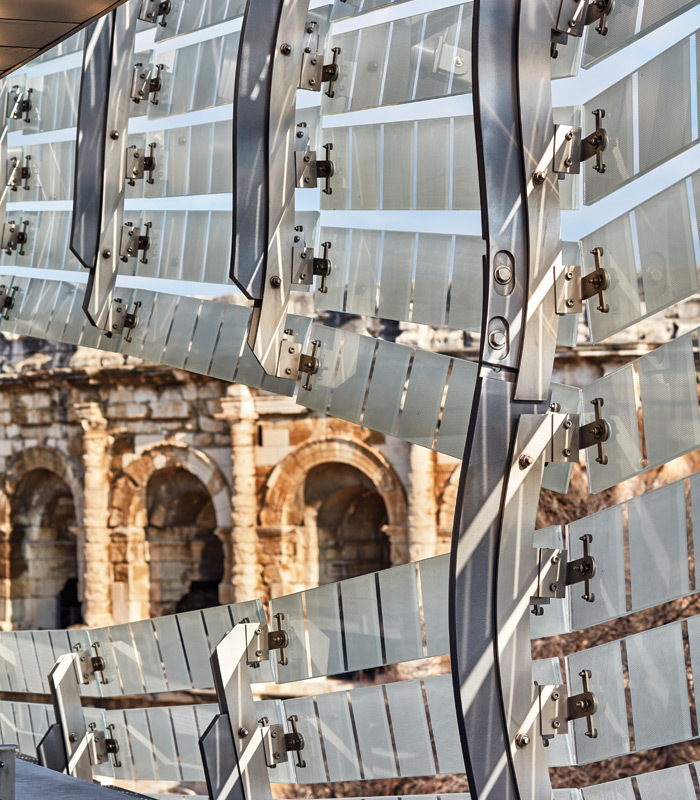 The site was adjacent to the greatest of the structures the Romans had built in the first century, the Amphitheatre or Arena of Nimes (known in French in the plural, les Arènes), which once hosted gladiatorial fights. The competition attracted 103 entries. The Carré d’Art exhibited the proposals of the three finalists: Richard Meier & Partners Architects, Rudy Ricciotti, and Elizabeth de Portzamparc (whose husband, Christian de Portzamparc, is also an architect). The jury chose her design. De Portzamparc lists three approaches to a new building’s potential relationship with an ancient monument. One is ‘by pastiche’, she explains — mimicking the monument. 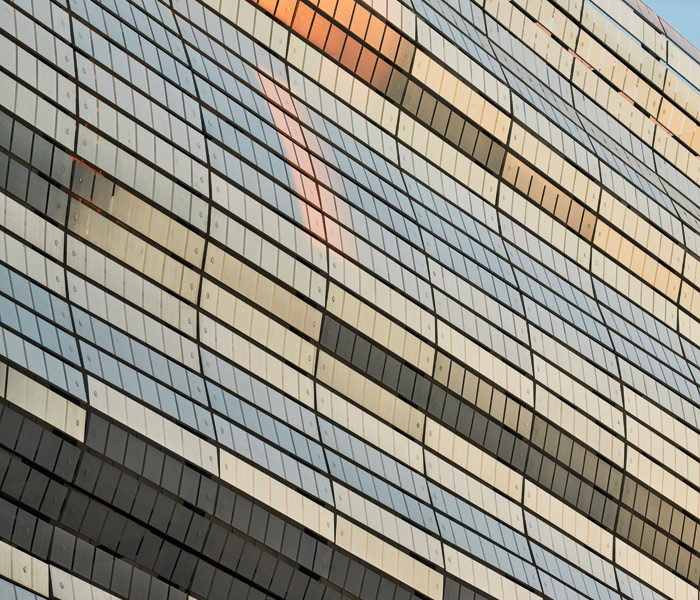 Another is ‘by erasure’, when the new building simply reflects the monument and ‘disappears’. To some extent, Foster’s Carré does both these, presenting a grand entrance facade behind columns and using glass, although that doesn’t disguise its presence. But de Portzamparc’s strategy took a third approach, based on a dialogue ‘where the principal elements of the new building are contrary to principal elements of the historical building’. The concept she presented had a 45m x 45m main volume, a rectangular box, which above the glazed ground floor is wrapped in a translucent, fluid outer glass skin like a veil — a complete contrast to the solidity of the curving Arena. ‘I like the idea of lightness,’ de Portzamparc comments. She summarises the dialogue between the buildings as ‘glass v stone, rectangular v round, floating v rooted.’ There is a lot more to the design within and beside this main volume, and not least an accessible upper level with an extraordinary garden that connects with de Portzamparc’s Brazilian origins. Construction of the 9,000 sq m museum began in 2015 and finished in December 2017, followed by its 3,400 sq m archeological garden this year. The full complex opens this June. How has the vision translated into reality? The outer skin, as intended, is the most immediately definitive visual gesture and it wraps around the main volume completely. Above the main entrance, the facade faces the street, separating the museum from the Place des Arènes in front of the Arena, and continues along the sides of the museum, down the Avenue de la République on one side, and on the other, the Rue Alexandre Ducros, which gives service access. The fourth side overlooks the new archeological garden. Some 2,500 sq m in area, the veil of the outer skin undulates gently across the flat facades as if it were a loose fitting white cloth over which a breeze was passing. 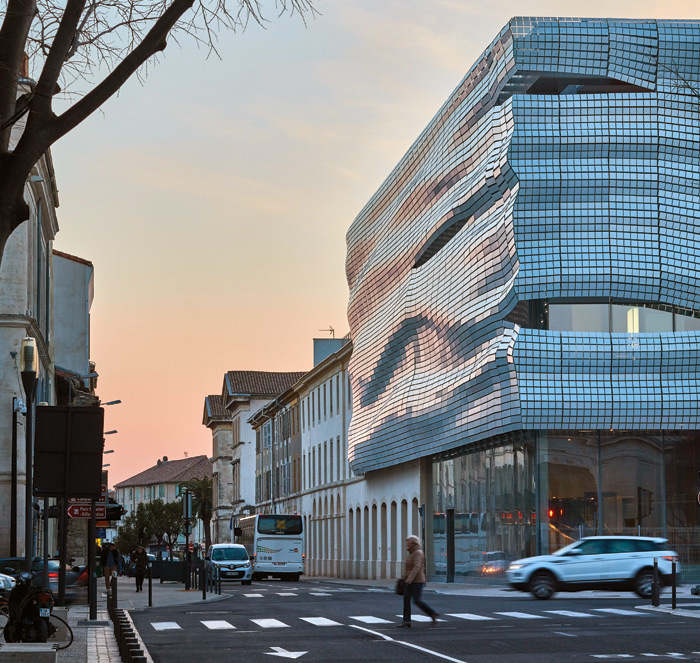 The facade is formed of 7,000 separate glass strips, each 1.5m long and bearing a row of 19cm x 19cm ceramic squares. The outer skin is mounted more or less 0.5m from the building on a lightweight vertical structure, which includes lengths of mesh walkway providing access. The squares filter the sunlight, and the whole double skin performs as a huge climate-moderating device that channels ventilation naturally and functions completely passively. The outer skin could have been continuous moulded glass, but that would have been more expensive and required a heavy load-bearing structure. And with a system of discreet glass strips, de Portzamparc was able to create openings across it, like slashes along the weave of a fabric. Something a model or a rendering cannot show is how a facade reacts to different light, and the museum’s interplay with it is beguiling. In direct sunlight it is as bright and clean as fresh white latex, but it also has a metallic, reflective property, so that it suggests flowing water. From certain angles it can glint, or catch the blue of sky and grey-brown of stone. As evening falls, the facade is like a wrap ripped by a storm, and the museum interior shines out where it has torn. At night, the facade becomes a silently dynamic screen as it reflects the colour of lights of surrounding cars and traffic signals. There is physical as well as visual permeability. De Portzamparc designed it ‘to be open to the town and allow the city to enter through interior places and streets, linked to public exterior spaces’. The museum is cut by a ‘street’ that runs along a line where Roman fortifications once were, which is marked on the Arena’s plaza, and continues as a wall ruin in the archeological garden. The street divides the ground floor facing the Arena before passing through the building. Once inside, it slopes gently down and passes through an extraordinary spatial transition. First it becomes a bridge that narrows in width, then it enters a 5m-high metallic vestibule to the archeological garden, from which light is bounced into the building. This bridge crosses a great 17m-high atrium, rising from the basement level. It does more than provide a dramatic sense of internal volume — it also suggests the full dimensions of the entrance of a temple the Romans built in the year 1BC, The Sanctuary of The Source. Little remains of it, but there are columns flanking the path, remnants in the basement, and fragments of its pediment mounted high in the atrium. The bridge spans just 7m of space, but the atrium spans two millennia of time. Back at the Arena side, the museum entrance and the museum’s restaurant, the Michelin-starred La Table du 2, lie either side of the internal street. In the entrance lobby, behind the long curving sweep of the front desk, an enclosure of circular wall widens out like a cone, its top edge spiralling up towards the ceiling. This is a cloakroom and home for the audio guides available to visitors, and it is almost like a Richard Serra sculpture, but shiny. 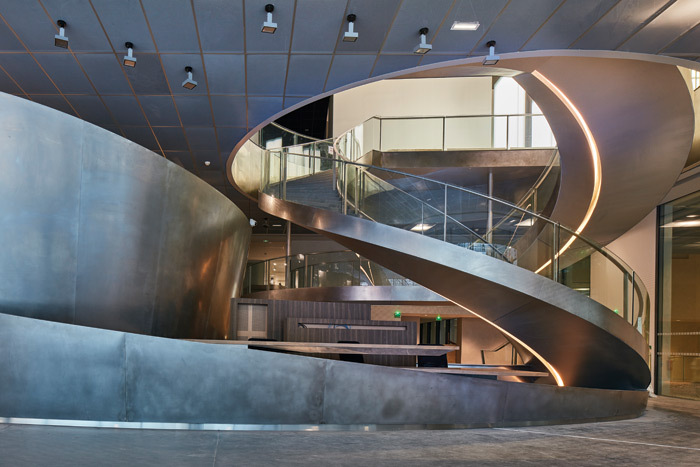 Adjacent to it is a double helix of metal staircases with glass balustrades rising to an arc of floating mezzanine that introduces the exhibition levels. 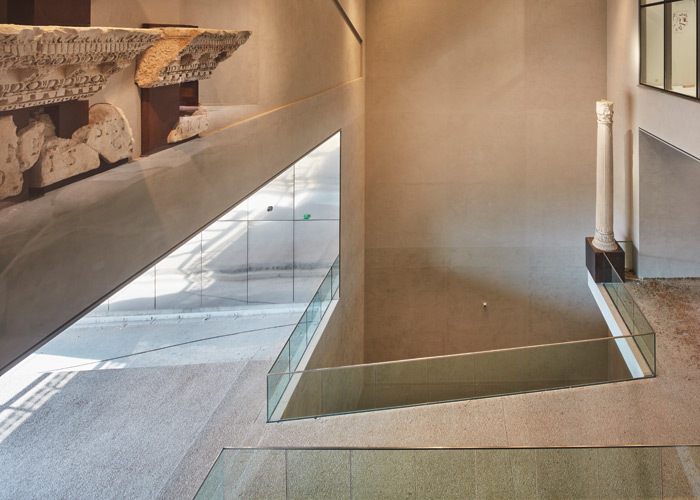 Spiral staircases continue upwards through the main first-floor exhibition level, as do concrete columns that are polished to look like limestone. From the galleries, those gaps in the outer skin peep open like huge sleepy eyelids, positioned particularly for the best views of the Arena. The museum’s collection of 5,500 items is diverse, from a three-tone mosaic of Bellerophon to oil lamps and vases. One gallery displays models that include the biggest Roman amphitheatre of all, the Colosseum. The museum continues into a second volume along the Avenue de la République, behind retained late-19th-century facades that emerge from behind the outer skin. It includes educational facilities and offices, and in the basement, a 250-capacity auditorium with seating by Elizabeth de Portzamparc for Poltrona Frau. The other side of this volume has a plain modernist glass curtain wall overlooking the archeological garden. The garden site had been in a sorry state. The ruins of the Roman linear fortification, rising barely above the ground, had been engulfed in a car park. When landscape architect Régis Guignard saw it, his reaction was that it was ‘necessary to create a revenge of history against this kind of modernity!’ He has created not just a Roman-inspired garden but two more, with plantings related to the Gauls (who were settled in the region before the Romans), and to the Medieval period long after — ‘successive layers that descend into the depth of the regional memory,’ Guignard says. It’s a kind of botanical garden, he explains, which will foster insect biodiversity, including bees. The Romans loved evergreen species and also brought medicinal plants, condiments and spices such as rosemary and thyme, all reflected in the plants chosen. Overall the gardens contain more than a third of the species that people would have consumed at the time. 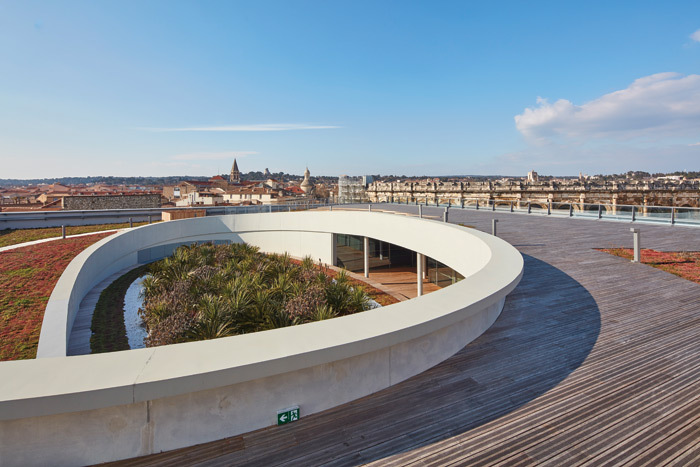 The icing on the cake of the museum architecture is a publicly accessible roof garden above the second floor, called The Terrace. The competition brief did not specify any amenities above the museum, but when de Portzamparc first visited the site, it was Nimes’ third Roman monument that instigated the idea: ‘I decided to create this terrace to show visitors the first Roman monument created in Nimes — the Tour Magne.’ This tower was the first because it actually predates the Romans, having been built on a hill by the Gauls, but Emperor Augustus doubled its 18m height and incorporated it into the Roman fortifications. 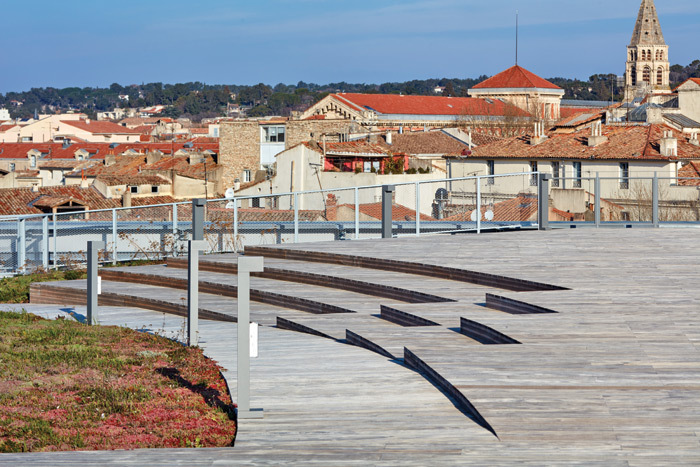 Now, its restored ruins are visible on the horizon from an extraordinary roof garden, which spans almost the whole of the main volume. Stepping out of the lift on the second floor, you find yourself in a passageway surfaced with boardwalk. Beside it is a restaurant, which opens on to a terrace facing the Arena. But straight ahead in the passage is the heart of Guignard’s fourth garden, a profusion of plants raised in an elliptical planter in the centre of the volume. Reaching it and turning clockwise, the boardwalk slopes up around it in an elliptical spiral, to reach the full expanse of the roof over the second floor, which faces the central green plantation from under a dazzling white, sweeping cornice. The roof is partially boardwalk, stepped in places. It is also planted with expanses of hardy wild species that can stand exposure to strong, direct sunlight. The view is all-round and breathtaking, and it includes the Tour Magne peeking over trees beyond the receding curve of the Arena, which is just higher than the museum’s 19m roof level. There is, after all, a complementary dialogue with the Arena, in the elliptical form at the heart of this green roof. In the Terrace’s simple, sweeping curves, there is also an echo from somewhere more distant. De Portzamparc’s father knew Oscar Niemeyer, and she admits his influence here. The Terrace is ‘very Niemeyer’, she says; ‘he was the king of curves’. It’s too early to say if the museum will survive as long as the Arena already has, but de Portzamparc is certainly thinking beyond the present. She says that ‘architecture is not a consumer product and I designed this building to last.’ One of the general principles of her architectural philosophy is ‘to avoid the obsolescence of the building’ — and on a practical level, that means flexibility. ‘I do a “total flex” architecture,’ she insists. In the museum, spaces are designed to be reprogrammable so that they are capable of adapting to evolving, changing use. De Portzamparc also says that architecture should ‘be able to be appreciated in the future, to resist fashion’s ephemeral aesthetics’, adding that she is ‘tired of expressive forms’. Instead, she seeks an economy of form. With the museum, there may be spatial drama within, and a unique, outstanding visual dimension to its envelope, but the main volume is essentially a square box. A cornerstone of de Portzamparc’s architecture is to produce space that encourages social interactions. The gardens are obvious examples of this in the museum. She also connects the museum with the city by incorporating very public spaces, including the internal ‘street’, so that spaces ‘allow the city to enter them’. The device of a bisecting ‘street’ is something she also uses in another project — the Grand Document Facility at the Condorcet Campus in Aubervilliers, Greater Paris, due to complete in 2019. As with the open, arched apertures that punctuate the Arena, the museum has a visual permeability too. Not least, both buildings connect with the city, in that you can look out from either across it and the city is drawn to look back because the architecture is simply compelling. 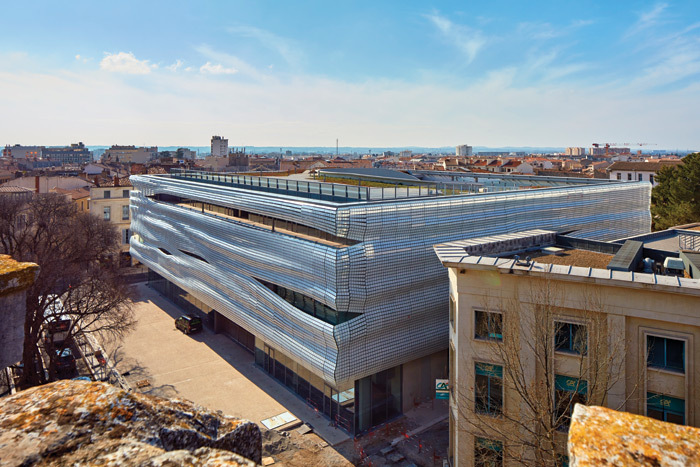 The Musée de la Romanité is a refreshing, luminous addition to Nimes. It extends the town’s offer to the visitor in an innovative way, and speaks to the town itself. It has a touch of va-va-voom, yet already it sits comfortably in a setting that has been special for two millennia. It’s been worth waiting for.